May 22: Reuben Anderson Ham was born to James and Lucy Ham in Mississippi. October 5: The U.S. Federal Census enumerated in Lawrence County, MS showed 17 year old “R.A.” living with his parents and siblings. His father, James, was a farmer. 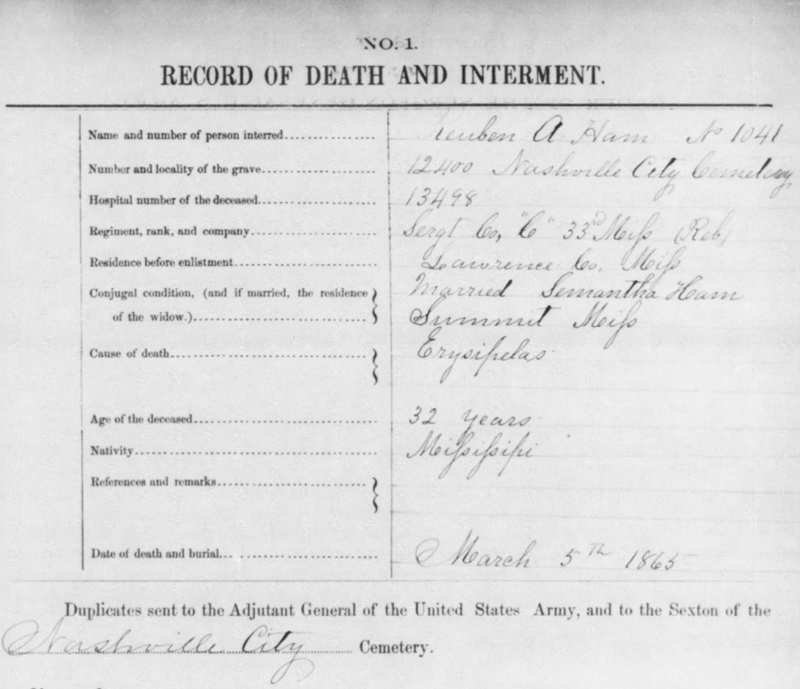 August 26: The U.S. Federal Census enumerated in Monticello, Lawrence County, MS showed 27 year old “Anderson” living with his widowed mother and siblings. The slave schedule listed him as owning 1 male slave, 20 years old. May 7: Reuben Ham enlisted in the Confederate Army in Grenada, MS.
March & April: Company Muster Roll. Present. By this time Reuben has been promoted to 5th Sergeant. July & August: Company Muster Roll. Presence not stated. December 17: He was captured in Franklin, Tennessee. January 27: Admitted to U.S.A. General Hospital No. 1 Nashville, Tenn. Injury: Gun shot wound third finger of left hand. Date of operation: Dec. 2, 1864. Operation: Amputation of third finger left hand at metacarp phalangeal articulation. Diagnosis: amputation 3” finger lt hand and fracture of lt radius. Missile: Can. Ball. Treatment: Cold water dressing. Age: 32. March 5: Reuben died in Nashville, TN of erysipelas (infection) from his finger amputation. He was buried in grave #12400 at the City Cemetery.